Ephrata Martial Arts is committed to building strong individuals and families, and a healthier community by empowering its students with the positive benefits of martial arts training. Ephrata Martial Arts is dedicated to its affiliations with world-class individuals and organizations in the martial arts industry that promote the same philosophies shared by its leadership. It is through these relationships that Ephrata Martial Arts extends its sphere of positive influence to the community both local and abroad. Read more about our instructors and assistants here. Ephrata Martial Arts is the largest, most successful mixed martial arts school in the Ephrata, PA area. Since 1997, Ephrata Martial Arts has been the Ephrata and Lancaster County and surrounding area’s best source for top rated mixed martial arts instruction—producing some of the nation’s top talent in SAMBO grappling, kickboxing, sanshou, and MMA. ​The spacious martial arts studio is located at 248 West Fulton Street in Ephrata, next to Modern Cleaners. The Ephrata Martial Arts training facility has ample room and equipment to accommodate the nearly 100 students who train in Mixed Martial Arts (MMA), Kickboxing, Sanshou, Grappling, SAMBO, and Submission Wrestling. Ephrata Martial Arts is continually investing in its training facility and equipment. A full-size kickboxing ring and a cage along one side of the training area provides a dedicated, realistic, training area for timed rounds of sparring and rolling. The training floor at Ephrata Martial Arts is padded wall to wall with Zebra Mats, the same wrestling mats found at world-class grappling competitions such as NAGA and Grappler’s Quest. Heavy bags, speed bags, headache bags and Century Wavemaster bags in addition to Thai pads and various focus mitts provide the platform for Kickboxing drills—all of which are timed using a regulation round timer. Grapplers use throwing dummies of various weights, spacious crash mats and a variety of resistance bands and training implements. We constantly update our training facility to make certain that our students receive the best possible training. However, the real wealth lies in the knowledge base that the staff at Ephrata Martial Arts possesses. Th studio was formerly Parker's Self Defense teaching traditional Kung Fu techniques, forms, and weapons. 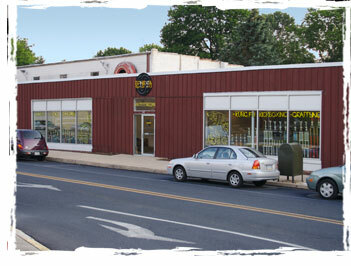 The studio was renamed Ephrata Martial Arts when the move was made to the current location on West Fulton street in 2005. For over ten years, Ephrata Martial Arts has improved the lives of its students one class at a time. Our continued success is a reflection of the hard work and dedication of our instructors, assistants, and most importantly, our students. Ephrata Martial Arts is a living, ever-evolving system of self defense and artistry—a family of members of all ages, all abilities, and all walks of life, all of whom are dedicated to learning and growing. They have come in search of something. And, no matter what that something is, they’ve found it here. During the past several years, and under the leadership of Owner and Head Instructor Coach Justin Press, Ephrata Martial Arts offers a true Mixed Martial Arts system consisting of disciplines including Kickboxing, Sanshou, Grappling, SAMBO, Submission Wrestling, and Self Defense. Something for everyone, right? That’s only the beginning.